Felixstowe Chess club meets on Tuesday evenings at the Royal British Legion Club normally from 7.30 until about 10.00. We play friendly chess and hold club tournaments from time to time. We currently have two teams entered in the Suffolk Chess League. The season runs from about October to April the following year. All new members are welcome regardless of their playing strength. We expect only two things: A love of the game and a willingness to learn. *To see more of this quotation go to The Defence. 'We applaud your site's ease of navigation, unique graphic displays and content'. Welcome to Felixstowe Chess Club's award winning web site. A big site for a small Club! Feel free to sign our guestbook and recommend us to your friends - see below. Welcome to the official home page of Felixtowe Chess Club. A big site for a small club! The club was founded on October 16th 1945. Seventeen people attended a meeting held at Felixstowe Secondary School. Dr. Johnston was elected to the chair and Mr. E. R. Springham was elected as Hon. Secretary & Treasurer . It was proposed by Mr. Herring and seconded by Mr. Goose that the club be called "Felixstowe Chess Club". "...He forgot everything, stick, hat, umbrella; above all, however, he would always leave behind his traditional yellow leather briefcase, so that it was said of him: wherever [his] briefcase is, there he himself is no longer to be found. It is therefore evidence of [his] pre-existence." To see who he is click here. This site is really two sites in one. Felixstowe Chess Club Pages: Home Page, Fixtures, Results & Events, Members Page. They are now color coded! Felixstowe's pages are one color; my own are another. Contributions* to this site are welcome from anyone! *I am only able to accept these on a floppy-disk or a cd-rom. If you like this site recommend us to a friend! Some important dates: Click to View or Add Text. Feel free to add some important dates of you own! New! » Visit the Members Page. The above position comes from e U.S. Championship, 1999. Black to play. What happened next? Work it out, it's not that difficult! For the answer go to Feeney - Plesset. I've just received the latest issue of Coffee Break Chess! Just click below. For books on chess coaching go the B.C.F. recommended list on the study page. For Nick Pert's games against Chandler go to Pert on the games page. Forgotten U.S. Master James Sherwin shows up in Blackpool and defeats Keith Arkell! Go to Sherwin on the games page. I've recently started a collection of Endgame Studies. Go to Studies on the Endgame Page. If you want to look at some more 'problems' go to the Problem Page. 'The Pride and the Sorrow of Chess'. Go to Paul Morphy on the Morphy Page. White to play resigned!! See what I think at JJJA v R Grayburn on the members page. The above is a beautiful endgame study by Richard Reti. It's White to play and win. For the solution go to Reti on the study page. To all those who visit this site: Read the following!! I intend developing this site further and any suggestions on how this might be done. I LOOK FORWARD TO RECEIVING THEM. Don't let me have all the good ideas!! The site email address is felixstowechess@lycos.com. ANY COMMENTS OR QUESTIONS?? about this site should be sent to me the webmaster also at the above address. In particular, the development of the study page. If you prefer speak to me at the club or phone me on 01394 670623. But whatever you do REACT in some way. I intend making this site interesting, informative, even amusing at times, but above all else, THOUGHT PROVOKING!!! Humphrey Bogart and Peter Lorre in a production still from the film Casablanca. The above picture has nothing particularly to do with anything but I just think it looks nice! Some things to look out for on the Net! Did you know you can play live chess on the internet? Itsyourturn This offers a kind of electronic correspondence chess. At the outset you can specify the maximum time limit per move. This can be anything from three days up to several weeks. When it's your turn to move a message is sent to your email inbox. For those who like this sort of thing this site may be what they are looking for. Personally it doesn't appeal to me in the least. Chess Cafe A tremendously interesting site. Send them your email address and they will send you their newsletter regularly. Complete with archive with lots of material to download. Visit it and find out for yourselves. HIGHLY RECOMMENDED. THE WEEK IN CHESS from Mark Crowther. This is one of the very best sites around. Comes HIGHLY RECOMMENDED! Highly recommended too is Chess Space, rated one of the top 5% of Web sites: it has links for openings and endings. Other starting points include Yahoo! - Chess Index & search. 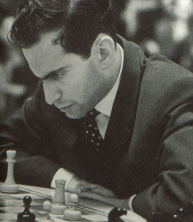 Some important Chess addresses: The BCF, British Chess Magazine, Club Kasparov, U.S. Chess, to name but a few. If you want to take a look at the very best chess magazine in the world [not to mention an impressive range of software products] visit New in Chess Magazine. Many publishers and suppliers are getting onto the Web, in the British Isles this includes Batsford, London Chess Centre [Chess Monthly] (N.B. the web site is "chesscenter", the e-mail is "chesscentre"), KingPin magazine, Chess Mail. Commercial suppliers on the web [like ChessBase, Yasser Seirawan's Inside Chess] can be found at Chess Space. They may have samples to download and/or a collection of links. One particularly for young players is to be found at Chess For Students. Chesscorner is, I think a fantastic, resource. This is a non-profit making chess website created by a chess enthusiast for chess enthusiasts, especially those new to this fascinating game. There's everything here for the beginner right up to expert level: software and lots of games to download [note that the games are in a 'zipped' format and you will require a bit of software like 'winzip' which, if you don't already possess, it can be downloaded from www.winzip.com. This is very easy to use and comes with good help files.] In addition to this you there is lots of stuff on world champions, openings, a chess forum where you can share your thoughts with other chessplayers all over the world. My god there is even a section you can go to to send chess greetings cards! As a bonus it say's it's fun too! Incredible; Just imagine that - why wasn't I told! Absolutely wonderful!! TRIPLE 'AAA' RECOMMENDED!!! Just click on the banner below to go there. I will be constantly updating this list and welcome any additions to it from club members. I did not have any influence on the organization and contents of any external linked pages. Herewith I dissociate expressly from all contents of all external linked pages on this web-site. Willard van Orman Quine, the dean of American philosophers, died at the age of 92 on Christmas Day. Just 50 years before, in December of 1950, he read a paper to the Eastern Division of the American Philosophical Association that rocked the audience back on its heels. "Two Dogmas of Empiricism," when published the following year, went on to become the most discussed and most influential article in the history of 20th-century Anglophone philosophy. Few pieces of similar brevity have had such an impact on the course of philosophical thought. It is a model of succinct and convincing argumentation, a good sample of Quine's elegant prose. But it is, above all, an imaginative breakthrough. For in it, Quine raised in a new and urgent form the old question of the relation between philosophy and empirical inquiry. For my favourite Philosopher! Click here to go to Quine's Home Page!